Gilbert MacAdam was a member of the Waterhead family. He was imprisoned in 1682 and again later. He was banished to the plantations. However, he was able to buy his freedom and returned to Scotland. He was attending a prayer meeting near Kirkmichael House when it was surrounded by soldiers. MacAdam tried to escape but was shot. Tradition has handed it down that this stone was recut by Robert Paterson, alias “Old Mortality,” who died in 1800; and an interesting circumstance connected with it is that one morning the name of the persecutor, “the laird of Culzean and Ballochmil,” was found erased by some friends of his, although the erasure was speedily filled in again. 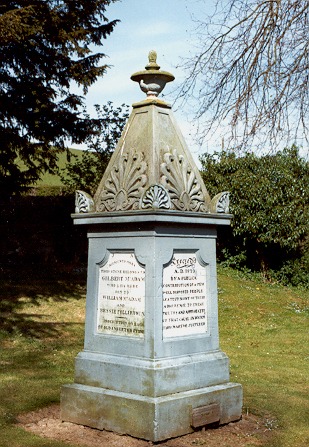 This ancient stone was later inserted in a larger and more imposing memorial (erected 1829).